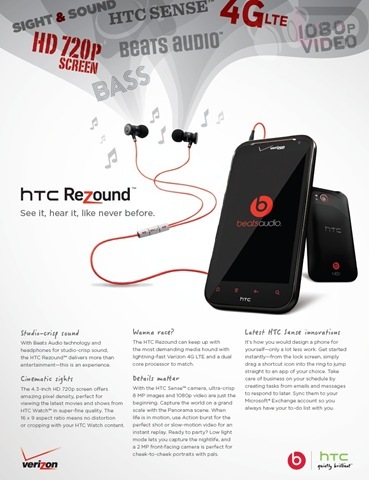 The HTC Rezound that was recently announced by Peter Chou in NYC is one to keep an eye on as it’s bit of a beast of a Smartphone. 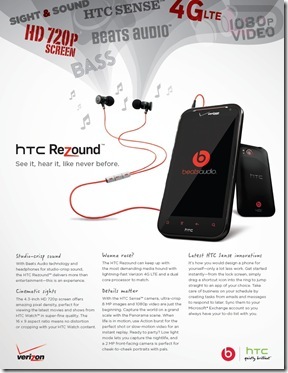 The HTC Rezound that was unveiled for the US market simply slaps down the UK equivalent that is the HTC Sensation XE. In terms of specs it beats it hands down (sorry for the pun), Coming with a 4.3” screen that’ll produce the the first 720p screen in the US for an Android Smartphone and running a resolution of 1280×720, in comparison the Sensation XE is just 540×960. It’ll be powered by the same 1.5Ghz dual-core processor, the storage for the HTC Rezound is also 16GB Onboard and 16GB Memory Card too, it’s a slap in the face to the paltry 1GB onboard Sensation XE and especially as it’s music driven with Beats by Dre, 1GB of RAM instead of 768MB on the Sensation XE, The Rezound also has a 8MP rear facing camera with Panoramic mode and it’ll record in 1080p video. 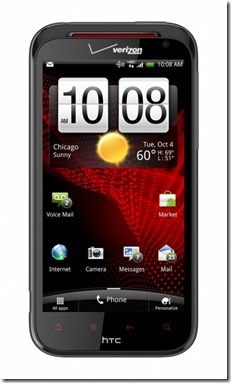 It’s a beast that’s for sure and it comes with Android 2.3.4 and Sense 3.5, no i hear you saying what about Ice Cream Sandwich, well it’ll be ready for an ICS update and that’s confirmed for early 2012. 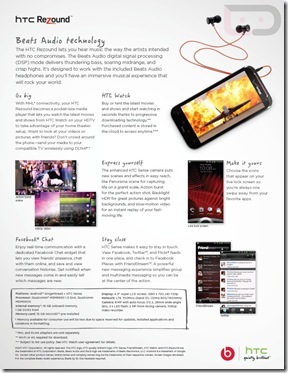 Mobile Hotspot Capability: Share 4G connection with up to ten Wi-Fi-enabled devices. Operating System: Includes the Android 2.3™ (Gingerbread) OS with the latest HTC Sense — an upgrade to Android 4.0 (Ice Cream Sandwich) will available in early 2012. Coming pre-loaded with Beats by Dr Dre Audio technology which means integration with all the media functions of the phone and comes with a pair of Beats by Dr Dre in-ear headphones. We can only hope that HTC bring something to the UK shores similar or better as the current Sensation XE or even bigger XL are not good enough to challenge the Galaxy Nexus, Galaxy Note, Galaxy SII or any other handsets that’ll be introduced by the big guns soon. 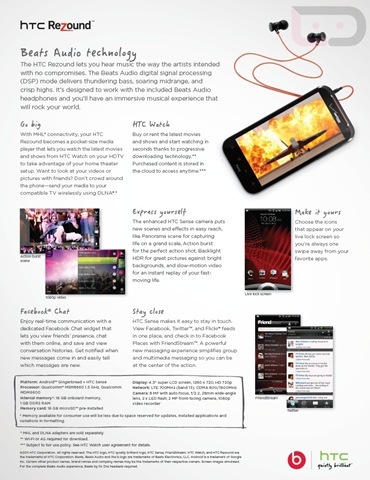 Below is the leaked PDF documenets showing you all the specs and Rezound in all it’s glory, as well as i nice little promo video of the HTC Rezound.